I’m at the point where I am going to deploy some PowerShell scripts to my end-users, and I want to test the scripts on a fresh installation of Windows before trying them on the user’s workstations. I use VirtualBox to create virtual machines for Powershell testing. Virtual box works on Linux, Mac and Windows host machines. My 8 gig Win 7 box works fine with one or two “guest OS’s”. On my 4 gig (ancient) iMac, it works, but its pretty slow. 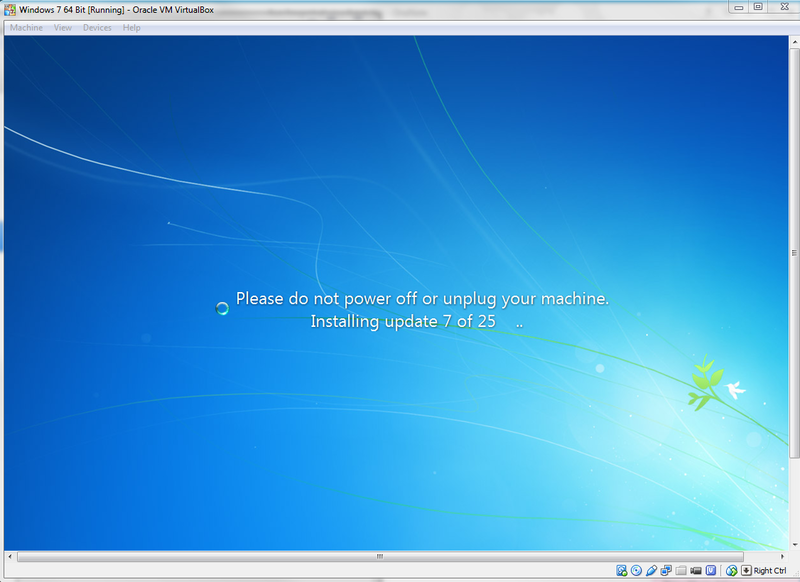 One thing that I find amazing, is you have to run updates on all those Windows Virtual machines. Don’t expect to be fully productive on Tuesdays or Wednesdays, when Microsoft sends out Windows updates. It isn’t unusual for updates to run for an hour or more. Be sure to install the VirtualBox “guest additions” within your Windows VM, once you’ve got your Windows VM up and running. You may also want to change the network settings to “bridged”, so that your VM is on the same network subnet as your host machine. One other disconcerting thing; your Windows 7 desktop may come up with a black background depending on whether you are running the aero interface and other such fripperies. You can turn all this stuff on if you want; but it will slow down the performance. More details on setting up VirtualBox are located here and here. If it isn’t 4.0 or later, download the latest version of the Windows Management Framework from Microsoft. This entry was posted in Uncategorized and tagged Debugging, Mac, Networking, Powershell, Resources, Virtualbox, VirtualBox on March 30, 2015 by lkeyes70.